Over the past few years, Toronto’s East Bayfront area has undergone a redevelopment phase, which began with the Corus Quay building. 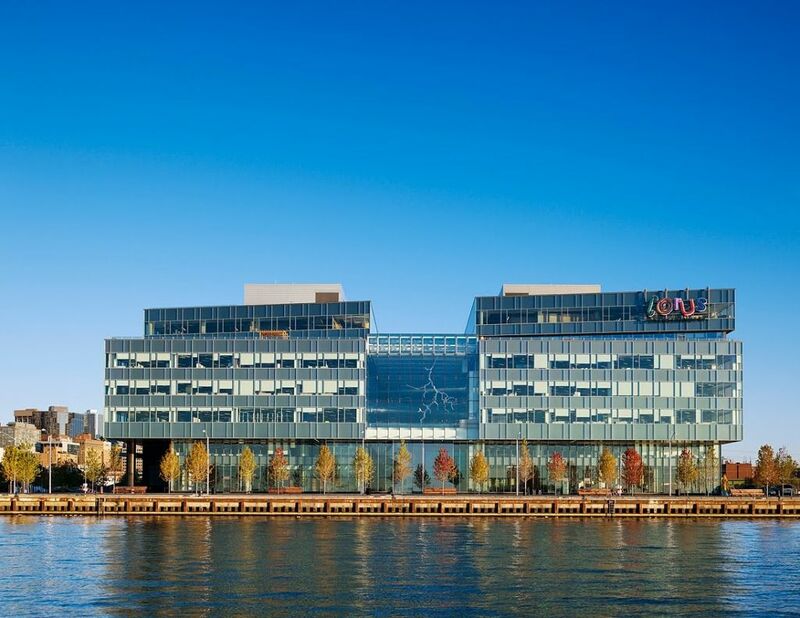 Completed in 2010, the eight-storey, nearly 46,451-m2 (500,000-sf) glass-clad structure was designed by Diamond Schmitt Architects for the new headquarters of Canadian media and entertainment company, Corus Entertainment. The new facility consolidated approximately 1200 employees from 11 offices into one location. The project has been certified Gold under Leadership in Energy and Environmental Design’s (LEED’s) Core and Shell and Commercial Interiors categories. The building boasts various sustainable, efficient design elements including the Green Roofs for Healthy Cities (GRHC) award-winning, five-storey “living” wall. This interior biofilter-wall is located in the atrium and is able to naturally improve the building’s air quality while also reducing energy consumption. Other materials such as adhesives, sealants, and coatings included in the interior construction were specified for low levels of volatile organic compounds (VOCs). There are also vegetated roofing assemblies that provide outdoor space for employees and reduce the heat island effect. These assemblies include a cistern that collects and recycles rainwater, reducing the building’s water consumption by 30 per cent. Metal wall panel systems and accessories were employed, and also contributed to the building’s sustainable design due to their long lifespan and recyclability. Additionally, sustainable lighting fixtures were installed throughout the building following the Digital Addressable Lighting Interface (DALI) protocol. Dimming controls and occupancy sensors were installed to reduce energy consumption and only use light when necessary. This technology also incorporates daylight-harvesting, and is able to dim lights when there is enough natural light penetrating the interior. The glass-clad structure employed a metal wall panel system for its sustainability, long lifecycle, and recyclability. During construction, 75 per cent of waste was diverted from landfills, and various materials used were from local sources. For example, the wood wall in the atrium was hemlock reclaimed from a 1910 ferry terminal wharf in Toronto’s harbour. In addition to office space, the ground-floor houses broadcasting and television studios, a restaurant, and access to Toronto’s Sugar Beach park. Employees are also encouraged to take sustainable transportation, such as public transit or bicycles, with bike-racks and onsite shower facilities. The overall East Bayfront development space spans 22 ha (55 acres). In addition to Corus Quay, and Sugar Beach, George Brown College’s Centre for Health Sciences, has been completed. Further plans include mixed-use facilities such as a condominium, boardwalk, and the Queens Quay east-west thoroughfare street. 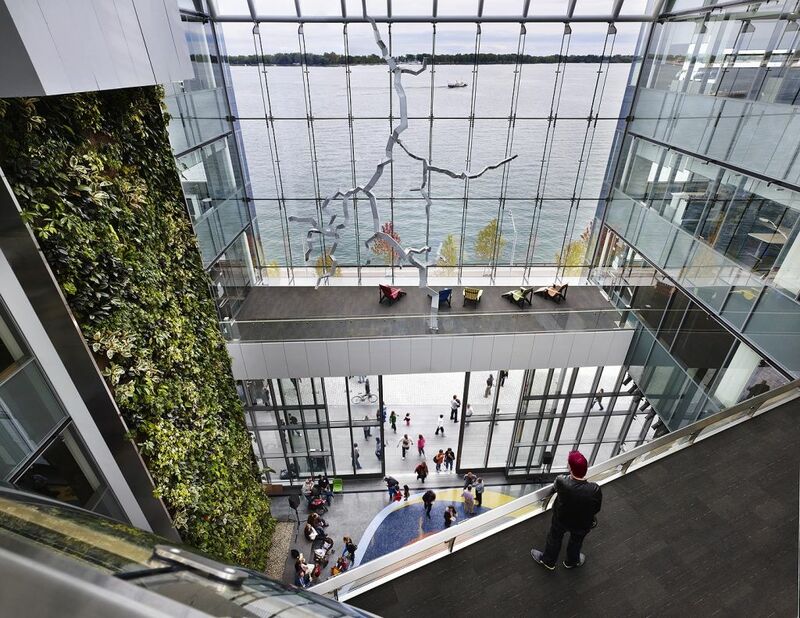 “Corus Quay is the template for the entire East Bayfront development, establishing the scale of buildings to come, providing connection to the waterfront for both occupants and the public, as well as setting a high benchmark for sustainable design,” Jack Diamond, principal at Diamond Schmitt Architects, told Construction Canada Online.